It is a fine day in classic video game junkie land. Released falsely yesterday on atariage.com as a "long lost prototype", Bob DeCrescenzo's (aka PacManPlus in the Atariage Forums) Pac-Man Jr. prototype ROM generated a furor of activity in Atari land that hasn't been seen for a while. I know I was all fired up for sure. ...BUT, it's a homebrew, which doesn't really degrade the game itself, but it does remove the fairy-tale element of "someone found this in a box of old Atari Corp stuff in an old warehouse" from the picture. 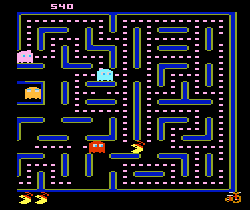 Still, if there was a Pac-Man game to work up for the 7800, this is definitely the one I would have chosen. You can get the ROM image from atariage.com. Works excellent in the ProSystem emulator.